Chicago | Reuters — U.S. cattle futures rose on Tuesday, supported by technical buying after falling on Monday, traders said. The benchmark Chicago Mercantile Exchange October live cattle futures contract found support at its 100-day moving average. The market has not closed below that key technical point since July 13. Hog futures were mixed, with the front month contract easing slightly while deferred offerings firmed. CME August live cattle futures ended 0.775 cent higher at 107.975 cents/lb. (all figures US$). The most active October live cattle contract was up 0.575 cent at 108.725 cents. 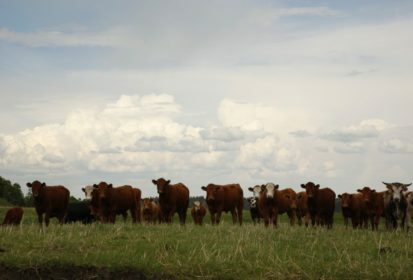 CME August feeder cattle futures rose 0.2 cent, to 148.85 cents/lb. and September feeders were 0.075 cent higher at 148.525 cents. Most active CME October hogs settled up 0.2 cent at 51.85 cents/lb. while the front-month August hog contract eased 0.525 cent to close at 55 cents. Support for the October hog contract was seen at the 20-day moving average. The contract failed to hold support above its 30-day moving average. — Mark Weinraub is a Reuters commodities correspondent in Chicago.